As a local pest control company that services areas that include Folsom, Roseville, and Sacramento, we hang our hat on our ability to get the job done right the first time. Now, there is a range of factors that go into accomplishing that goal, and we wanted to take the time to highlight why we are qualified for folks’ business in the greater Sacramento area. Keep reading if you are interested in learning more about our pest removal and management services, in addition to what sets us apart from the competition (at least, in our humble opinion!). In future posts we will go into greater detail, perhaps about all of the following points. But for now, we still wanted to provide you with some high-level justification for choosing us as your rodent and pest control company. You can, quite literally, reach out and get ahold of the owner of our company, Joe Hawkins. Joe is a second-generation pest control expert, with years of experience and therefore wisdom in this industry. Having access to Joe for any questions or concerns that you might have is a pretty nice perk. We genuinely value your time, and do our best to treat our clients the way we would want to be treated if we were in your shoes. Although we can’t control every situation, we do our absolute best to arrive punctually. If we are running a few minutes late, we’ll give you a call to make sure you are aware. We use top-quality botanical and natural products that have been scientifically tested. This fits in well with our environmentally-conscious, non-chemical treatment approach. We want to solve pest problems, but do so responsibly. Our staff has completed comprehensive training in the fields of pest biology, pest control methods, and materials used in practice. What’s more, our pest management technicians are licensed by the great State of California. The very first thing that we do is an inspection. Before any kind of treatment is administered, we need to know if there is a problem and what that problem is, and to map out a long-term solution which involves pest removal and exclusion/prevention. That’s part of the Earthwise Pest Management difference. We are equipped to handle more than just your average pest removal company. Earthwise Pest Management can handle pest exclusion, critter control, bed bug infestations, termite problems, wasp and spider control issues, and much more. 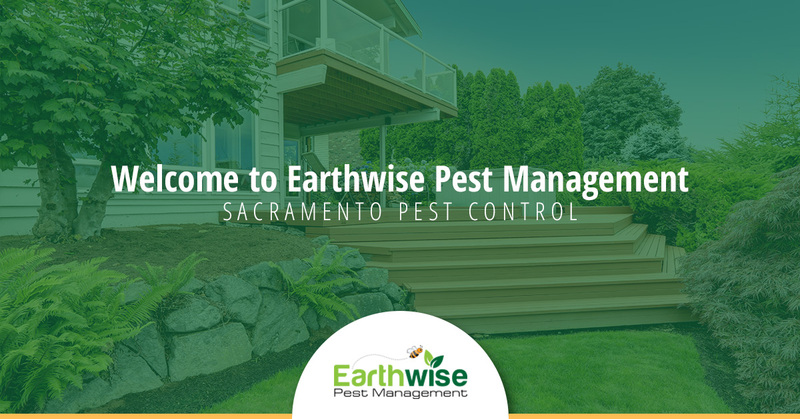 When it comes to home pest control in Sacramento, Roseville, and Folsom, Earthwise Pest Management represents an option which excels in blending quality with value. We don’t believe in charging people an arm and a leg for pest control services. We believe in providing our clients with a free, detailed estimate so they can make an informed decision about what way is best to move forward. On top of that, our Pest Exclusion Program uses a checklist to identify all areas of your house that might be “red flags” when it comes to a pest problem. We offer real estate inspections, we furnish recommendation reports detailing repair work that needs to be done, and we offer exterior perimeter plans where we can treat the exterior of your home or affected area. Ants. Termites. Roaches. Bed bugs. Mosquitos. Spider infestations. Not only can they affect your business property and building, but they can hinder daily performance as well. This is especially the case if you have any kind of traffic flow in areas which might have a pest problem. We at Earthwise Pest Management are equipped to affordably solve your problem with an environmentally-friendly method. Businesses we have experience in providing commercial pest removal and prevention for include boutique stores, schools, restaurants, offices, medical offices, gyms, government buildings, hotels, coffee shops, apartment complexes, and beyond. With pest treatment programs available on a monthly, bimonthly, or quarterly basis, you can enlist the Sacramento commercial pest control experts on an as-needed treatment plan. Did you know that bed bugs have made a serious comeback in the United States over the last decade or so? It seems like everyone these days either has been afflicted with bed bugs or knows someone who recently has been. Whether it is in your home, in an apartment complex you own, or perhaps even at a hotel, bed bug treatment must be administered swiftly and appropriately. We use heat treatments to control bed bugs. This is the most effective non-chemical method of bed bug control. We make sure all bed bugs and eggs are killed in this process. If you are experiencing bed bug issues, please, do not hesitate to call for our bed bug treatments; it’s a situation that requires immediate attention. Like bed bug problems, termite infestations are nothing you want to sit on. Yes, it’s a good idea to do your due-diligence when it comes to pricing and services offered; we certainly aren’t advising against that. We just want to make our prospective customers aware that on an annual basis, termites cause more damage than hurricanes or fires combined in the United States. Termites are difficult to detect without a professional’s help, so be sure to reach out to us if you are interested in a Sacramento termite inspection. Whether you are searching for mice control, rat control, squirrel removal, or just critter control in general, Earthwise Pest Management is also professionally equipped and experienced to be your local critter catchers. Rodents like mice and rats can multiply quickly, so it’s important to contact a rodent control company like our own before the problem gets out of hand. Our elite pest exclusion service includes a checklist to make sure we comprehensively cover any potential areas your home or business might be at risk of having a pest problem. View the linked page above for tips and tricks that can help prevent you ever needing to give us a call in the first place! Using a variety of methods that include exclusion, trapping, odor control, cleaning, and sanitation, we can flat-out solve your rodent problem. Give us a call for a home rodent inspection. Plain and simple, if you are looking for expert Sacramento pest management services, we are worthy of consideration. For the reasons described above, yes, but also because we are a part of Sacramento community, and are honored to be able to do our part to make everyone’s life a little bit better. Of course, when you have a pest control issue, that “little bit” becomes a whole lot bigger. Call us today to schedule your free estimate!